Chunxi Lu is the most popular shopping center in Chengdu. It's pretty hip and happening with a couple of underground ladies' markets that sell jewelry and stuff. The road recently expanded and added a lot of new stores with awesome store fronts. I was really surprised to see an H&M there...we don't even have those in Texas! I thought a lot of the clothes in there were too simple compared to what I was looking for so I didn't buy anything. Also found Dotacoko...this famous asian brand I recognized...expensive as hell though and not really my style. Their clothes are really simple and ladylike. 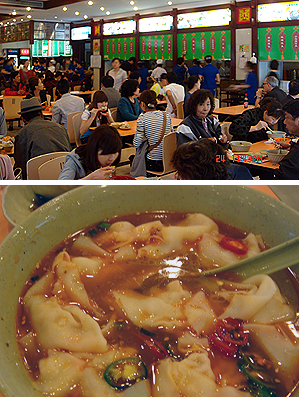 For lunch, my cousin and I went to this restaurant that consisted of small snack meals like dumplings and wontons. Haha it was really good. As you can see, everything in Chengdu is super spicy!